The course is designed to impart the competency skills and knowledge required to provide first aid response, life support, management of casualty/s, the incident and other first aiders, until the arrival of medical or other assistance. 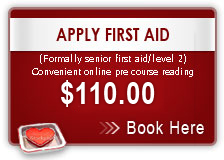 The completion of the course is followed by the National First Aid Certification, in Sunshine Coast. Anyone over 14 years of age can enroll for this course. It is suitable for anyone requiring a first aid certificate for the workplace, recreational purposes, sporting, or home use. A Statement of Attainment, valid for three years, will be rewarded to participants as soon as they complete the training. As per the Australian Resuscitation Council guidelines the HLTAID001 Provide CPR unit is recommended to be completed every 12 months. Participants are assessed based on their demonstration of skills and knowledge during an ongoing competency during the written test and a series of practical, throughout the course. Give First Aid focuses on providing easy to understand and fun First Aid, CPR, and Low Voltage Rescue training. All the courses are nationally certified and Work Cover approved. Give First Aid is proud to be a training partner of Immediate Response First Aid, one of Australia's most innovative training providers. Our team believes that the key to successful training is to provide the training in a fun, supported, inclusive environment. This workshop has also been endorsed by Royal College of Nursing, Australia, according to approved criteria. Attendance attracts 7 RCNA Continuing Nurse Education (CNE) points as part of RCNA's Life Long Learning Program (3LP). You can complete training at one of our training venues or we can provide it at your workplace as well. Once you select the course you want to enroll for, it’s easy to securely book your seat through our online booking system. First Aid, CPR, and Low Voltage Rescue courses are delivered by highly experienced, supportive coaches who are committed to you having a positive learning experience. You can also call us to book into a course, at 0753913491. If you prefer to meet us face to face, please drop into our training centre and book a course.